The good news is that in Waltham Forest starting a play street is fairly easy. The council has simplified the bureaucracy involved and their growing popularity means your neighbours are likely to be supportive. You’ll be surprised how much kids enjoy playing in the street even if there is a park nearby. The council provided me with a template letter to put through the door of each resident on the street in question by way of a consultation. Download it here. The council provided me with a template form to fill out indicating where I had consulted and when I wanted the event to run. I chose 3pm until 6pm on every last Sunday of the month. Download the form here. I then contacted the council to confirm they received the application and had put the regular closure on record. 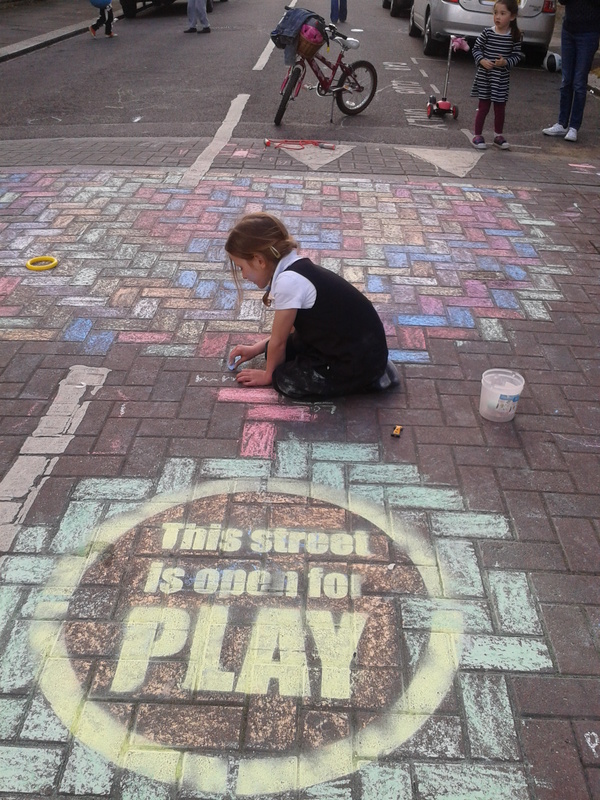 Current council contact to apply for a play street order are Iain King Iain.King@walthamforest.gov.uk, Tom Wright Tom.Wright@walthamforest.gov.uk and copy in Chris Harrison Chris.Harrison@walthamforest.gov.uk. The address for those officers is Low Hall Depot, Argall Avenue, London E10 7AS and the application should be sent or dropped in there for their attention. The council can be slow to respond but Paul at London Play can help to expedite the request so I suggest copying info@londonplay.org.uk in on all email communication. On the day the kids bring scooters, balls and skipping ropes. I generally bring a big box of pavement chalk as it’s great to see the colours remain on the road for a couple of days afterwards. Please feel free to ask me any questions as one of my aims with these events to encourage others to do the same on streets near their own homes. P.s. For more information on play streets visit the London Play website Play streets – London Play or download their London Play Street Guide. This entry was posted in Information and tagged kids, Play Street, useful info. Bookmark the permalink.